This year’s presidential election is affecting just about everyone. 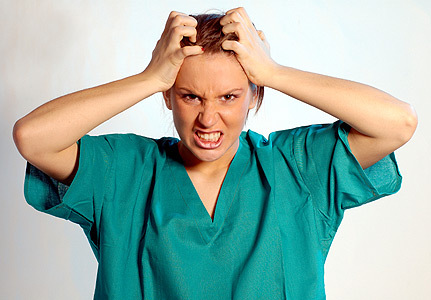 It’s causing so much stress, arguments, and overall negativity, that we couldn’t even get any nurses to go on record with tips on how they remain less stressed in this crazed political time and help their patients remain so as well. Many were concerned that if they gave their opinions—even about how to help others—that because it had to do with politics, they may be reprimanded or even possibly lose their jobs. That says a lot. Most nurses love to help other nurses. But in this case, the fear was tangible. Instead, we contacted professionals in the mental health field to get their advice on what you can do to reduce your stress in this final week before the presidential election and how to keep it reduced after it’s over. If you’ve ever flown on an airplane, you know that the flight attendant always instructs people that in case of an emergency, to put your own oxygen mask on first. You won’t be any good to others, if you can’t breathe yourself. Let’s face it—although we’ll get some relief after Election Day, there will still be fallout for some time no matter which candidate wins. Now that you have been reminded to take care of yourself first, what can you do? One of the easiest things you can do is just breathe. “My tip for all nurses is to set the alarms on their watches or cell phones to remind themselves several times per day to perform two activities—breathe and practice mindfulness. Three nice deep breaths several times a day can do a world of good to clear the mind and refresh the body. As for mindfulness, take a few seconds, clearing the mind of all thoughts except for noticing the temperature in the room and being mindful of all safely and calmness,” recommends Mary Berst, PhD, the associate program director of Sovereign Health Group in Palm Desert, California. Amy Oestreicher, a PTSD peer-to-peer specialist, health advocate, and speaker for TEDx and RAINN, suggests deep breathing as well and agrees that humor works. “Humor creates a common language the breaks barriers,” she explains. Oestreicher also suggests that nurses try a couple styles of management with themselves, two of which are Active Management and Calming Management. With Active Management, she says, you take all of the energy that’s fueling that stress and use it—exercise, run, shout, or scream. Do whatever makes you feel better. With Calming Management, you do just that—take actions that will work to keep you calm. That might be breathing deeply, meditating, getting a massage, or even taking a warm bath.